If government is metaphor for nature (and that may be a leap of faith), then its health is best assured by occasional watering. But you can’t grow a lush garden in a long drought. Enough figures of speech, let’s get down to cases. Amazingly to those of us who hoped for better, knowing full well it was too much to ask for excellence, the overwhelming umbrella of surveillance under which we stumble along is unacceptable. Were it not for a Bradley Manning here and an Edward Snowden there, along with the access provided by Julian Assange’s Wikileaks, who would possibly know what’s being done in our name? 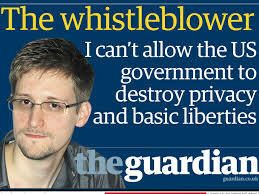 But Snowden and Manning are being made ‘examples’ of in the hope and expectation, not so much of punishing them, as shutting down anyone brave enough to let we poor, enfeebled and spoon-fed citizens know what the hell our government is up to. The deeper hole a leaker is thrown into, the less likely a source may chance that public burial and media-fed disgrace. Yep, it’s hard not to blame the press and TV (exception to come), with so few questions being asked and so much Kool Aid being drunk. I know they’re an easy target, but NBC, CBS, CNN, FOX and Cable are enablers all the same. 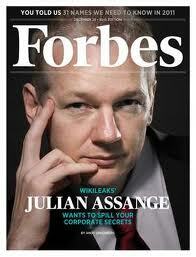 Question: Are Bradley Manning and Edward Snowden simply unheard voices without Julian Assange? Absolutely. They are fallen trees in the forest with no ear to hear. So, by themselves, their known facts are unknown. No contact, no foul. But there was an ear in the forest to hear. The Guardian Newspaper and the New York Times (here’s the exceptions) were that pair of ears. They chose to pick up a megaphone and broadcast the news from that dark, scary forest to the outside world. To answer the old question, the falling tree of disclosure did make a noise because there was an ear to hear it. So who is guilty of ‘espionage,’ the tree or the ear? No ear, no sound, no exposure of what our government has chosen to do in the dark. 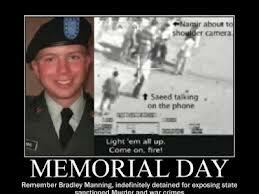 A thousand people knew what Snowden and Manning knew, perhaps ten thousand. If they shut the hell up and choked it down, they were legally in the clear. Upset perhaps, agonized possibly, unable to sleep peacefully we might presume, but clear of the most powerful nation in the world and its will to force down other nations’ presidential planes, intimidate any who might provide asylum and intimidate an already intimidated free press. Question: Who belongs in the dock, the tree, the ear or the broadcaster? The tree (falling or not) is un-indictable, because it’s the biggest tree on the planet and no one either dares (or has a chain-saw large enough) to trim it, much less cut it down. The ear we know to be blameless, because there are already thousands of upset, agonized or sleepless ears and it’s impossible to indict an ear. That leaves the broadcaster and perhaps that’s why media is so meek and the Guardian and NY Times so brave. As of yet, they are too public and powerful to make victims. As of yet. Two more points to make and I’m outta here. First, Washington, the nations of the world, corporate entities and you and I are leakers by habit and for personal gain. Can you keep a secret is a child’s giggling game and pretty much no one truly keeps a secret. We spill the beans regularly, political parties and nations against each other, corporations for advantage and you and I because we simply can’t stand being the only ones to know. Obama’s administration and all those before his leaked like sieves when it suited them and they continue to do so. Second, there are legitimate top secrets that governments must keep in order to function. When governments choose to stamp everything top secret and when really nasty and outrageous activity is covered by that tag, the rules of forests, trees-falling and ears-hearing changes. Our national conscience needs to deal with that. Not a single participant in the Abu Ghraib, NSA lies to Congress or Afghan helicopter abuses has been brought to justice. The exposers of those outrages are holed up in embassies or airports, in fear of a government out of control. Our national conscience needs to deal with that as well.